Are you hosting a gathering soon and want to add a splash of excitement and color to your party decor, but don't want to spend a ton of cash? 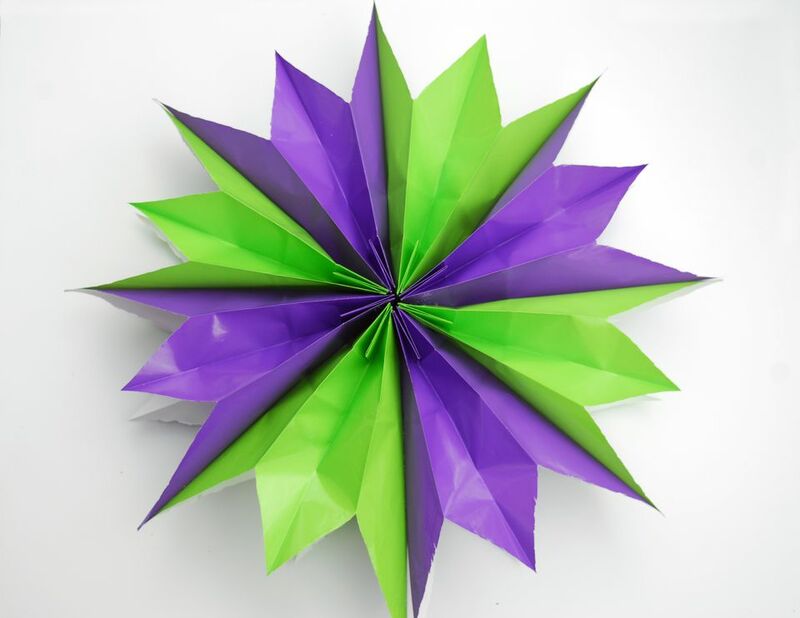 A paper star made from lunch or gift bags may be perfect for your party. Make each star from eight lunch or gift bags cut with scissors and held together with glue. These paper stars are fabulous when hung from the ceiling, and also are quick and easy to make. Kids can help assemble the decorations in no time, so why not make this craft a fun family affair. Paper bags come in a variety of colors. Check out the party section of any store. Pink and blue stars would look great at a baby shower, and pastel-colored stars would welcome spring. Red and green for Christmas and white or silver for a wedding shower. Just go with your imagination and have fun with it.The paper star party decorations can be multicolored or solid colored. You can even use white or kraft paper bags and decorate them yourself. You can personalize the paper stars with some sticker dots. Draw or paint some colorful artwork to make your decorations even more unique. Paper stars are perfect for kids to discover their inner artists. Teachers will love this craft too.These paper stars would be perfect for an art project for elementary aged children. Teachers could talk about color theory, Zen tangle art, or whatever theme they want to incorporate into their lesson plans. The finished projects are beautiful decorations for the classroom. The first thing you have to do to make a star is to press the flaps on the bottoms of your lunch bag paper sacks downward as in the photo above. Glue the folded bottom flaps to the side of the bags with hot glue or any other strong adhesive of your choice. You should now have a total of eight sacks with glued bottom folds. Your next step involves running a line of glue, using either a glue runner or glue stick, down the center of a paper bag and on the bottom edge as in the photo above. Place another bag evenly on top of the bag with the vertical glue line and press down firmly with your hand to secure the first bag to the second. Continue gluing and placing bags one on top of each other until all eight paper sacks are in a stack. If you want your party decoration to have two colors, make sure to purchase four sacks of one color and four sacks of another. Arrange the bags in a stack one color over the other until all of the sacks are glued into place. Using the ruler and pen measure and mark the top center point of the stack of paper lunch bags. Measure and mark the four-inch point on each side of the stack from the top. Draw a line with the ruler from the top center point to the left four-inch mark. Draw a line with the ruler from the top center point to the right four-inch mark. Cut a point from the top center onto the outer edge of the stack of bags. Use the photo above as a reference for cutting. Place your hands inside of the top bag and bottom bag of the stack and pull gently. The bags will spread outward into a circular star shape. Glue the top and bottom sack edges together, and your lovely star party decoration is complete. Use a hole puncher to punch a hole on the top edge of the paper star and attach some thread or thin twine, then hang the star decoration from the ceiling where desired. Multiple paper stars hanging from the ceiling add excitement and drama to your party decor. Make sure to hang your paper stars at different lengths from your ceiling to add interest to your design.